The OPEN Networks 824RLW is an ADSL 2+ Modem with Router, 802.11b/g Wireless Access Point with WPA support, 2x VoIP phone lines, Lifeline PSTN and 4x 10/100Mbps LAN ports. In essence the OPEN Networks 824RLW is a Rebadged Billion 7404VGP but much cheaper at about $110 with a few small differences: no Annex M faster ADSL2+ upload (but most ADSL2+ plans dont support Annex M anyway), the OPEN comes with an ADSL combined splitter/filter where the Billion just has a filter and the OPEN has 1yr warranty/Billion has 2yr warranty. 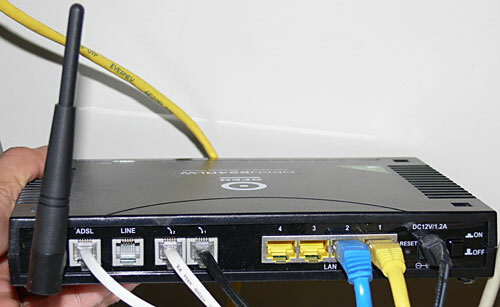 As an all in one solution you don’t need a separate VOIP adaptor using up an extra power point. 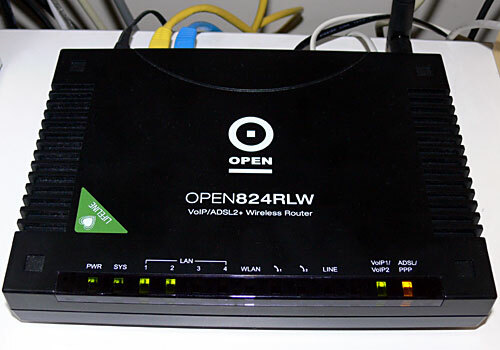 My new OPEN 824RLW replaces my old setup of a Zyxel ADSL modem/router + Sipura 2100 VOIP adaptor. The 824RLW supports downstream speeds up to 8Mbit with ADSL1, 12mbit for ADSL2 and 24 Mbit with ADSL2+. Both these speeds are pretty much the highest possible unless you live 5 metres from your telephone exchange so the 824RLW will probably get you the highest ADSL speed that your phone line quality allows. Automatic fallback back to Landline PSTN to allow you to make normal phone calls when there is a power outage, or when the Internet connection is down. Several people have managed to convert the OPEN 824RLW to Billion 7404VGP firmware newer than 5.53. NOTE: But once you done this, you cannot revert to Open Networks firmware again. Do it at your own risk and obviously lose your warranty. The Billion firmware is a bit more user friendly with VoIP in particular, having the common Aussie VOIP companies pre-defined and having the default dial plan push 000 calls to PTSN is a wise move. In August 2008 OPEN 824RLW retailer Cormain said that “new firmware for Open Networks is being tested … wait for the new 5.6 firmware from Open Networks” but nothing has been heard about that since. 5.53 is the current version being shipped. To view your ADSL synch speed: open the admin menu and click on the “ADSL” link under “Port Status” at the bottom of the screen. VoIP: 2 VOIP (FXS ATA) ports, 1 Landline PSTN fallback Failsafe (FXO) port, VoIP Dial Plans, PSTN Dial Plans, Supports Telephony features (caller ID, call forward, etc), Number of VOIP providers supported=10, T.38 (Fax over IP). Do you suggest any routers in particular for ease of use and EXTRA strong signal? I am thinking either a high end billion or a LinkSys. I have an OPEN 824RLW and have been suffering terrible garbled noise (with GOTALK) who recommend G729 codec as priority 1. I have removed and set G711A as priority 1 and G711u as priority 2. I am very keen to see how it goes as the wife is extremely frustrated!! Thanks for your comprehensive posting! Most useful posting! I am a little concerned about the firmware upgrade availability and the workaround to install the Billion firmware. However, the cost saving is significant (with the Billion 7404 at >$200 on eBay buy-it-now options. Have seen the Open824RLW 4 port for $97.00 at JM Technology. My problem is, this is based on their branded modem and not my Open, so I have no idea where to go to check/change these settings! Can you please help me? Billion has release firmware version 5.71 for the 7404VGP. Has anyone successfully installed this on an Open 824RLW? I tried installing the previous version (5.54b) to my Open 824RLW and it wouldn’t work. I’m going to try this latest version tonight but I’m not holding my breath. There are people out there that have done the upgrade successfully but they’re not divulging their method. The latest Billion firmware the 824RLW will accept is 5.54b. After that Billion has done something to prevent it from loading. I have tried all firmwares from 5.07 to the new 5.71 and 5.54b is the latest i could put on, the firmware will upload but the modem is bricked on next reboot. I have seen posts of people with 5.60c loaded on some but i think it is the 3 port version. The 4 port 824RLW cannot be upgraded with Billion 7404VGP firmware past V5.54b . The Open 824RLW only has one 128 MBIT SDRAM chip installed (IC42S32400-7TG on my unit). There is a vacant space on the PCB (under the Wireless board) next to this chip for another RAM chip which is probably installed in the genuine Billion 8404VGP units. Remember that OEM units are built for the cheapest possible cost and if this extra chip was not needed to run the original Open firmware, then it would not be installed. I have no doubt that the extra features that Billion put into each new firmware version will use more and more RAM, so that is why there is no new Open firmware past 5.53 (which is just Billion firmware with a different logo anyway). The newer Billion firmware will just not run on the cut-down Open hardware. In regards to what DC wrote, would it be possible to “install” another ram chip (identical to the current one installed) in the vacant spot? Reason I ask is that if it is indeed possible, then that should allow the 824RLW (4port) to operate with newer Billion firmware. Of course, this is just an idea. I think $109 is a good price for such a good router with voip. But another question: Why it has only 12 months warranty? Cheers for the info. I installed one of these for my Mum and its great. The 1 PC store in the town where she lives only had this unit and so I had no choice. Once I got it up and running (which was real easy) I decided I wanted one. However, I had bought the last one. Can anyone tell me where I can find a manual for the Open 824RLW and the installation disk? My disk has karked and Open Networks seem to have disappeared. I am using OPEN824RLW modem. This is a hand me down item and received as it is without box/disk/manual. Soemhow it worked but I am wondering if there is a installation disk [if yes where can I get a copy] and how to source copy of Manual for me to set up eg. wireless modem password access. Thank you. I want to know how to configure this modem. I don’t have anything except the Router (same as shown in pic) with me. Please help me. I still have two of these modems available and I have the disks and documentation which came with them. I will be happy to share any info to anyone needing help with the docs/disks, etc. The one thing I do not do is upgrade firmware and have no idea on firmware upgrades as I do not like doing it. I also have the 306 wireless lan adapters to go with the modems. and the installation disks for these. You may contact me at [email protected] for any help. Ah, I have all three of these, i.e. Open824RLW(4port), Billion 7404VGO-M, and the Billion 7404VNOX, and for all practical purposes, the 824RLW and the 7404VGO-M are the same – except for the VPN and the Annex-M, and if you need a Users Manual, I would suggest that you download a Billion BiPAC7404VGO-M manual form their site (www.billion.com.au) – if you ignore the VPN and Annex-M sections, it is virtually identical to the Open824RL manual. I gather the Open824RLW is no longer available, but the Billion 7402VGP and the Billion 7404VNOX are, and you should be able to find a 7404VGP or VGO-M online somewhere – and I am very happy with the 7404VNOX(1Gbit ether, 802.11n, and 3G USB modem port), but they sell for about $225- at the moment (I’m buying and setting one up for a friend at the moment). If your budget stretchs that far, the Fritz!Box 7390 has all this (ADSL2+) plus optical (NBN) fibre, and a 6 x DECT VOIP/PSTN Phone capability for about $339-00 + $109-00 per DECT phone. I want to know how we can configure this wireless Router Modem.I don’t have anything except the Router (same as shown in pic) with me. Please help me.